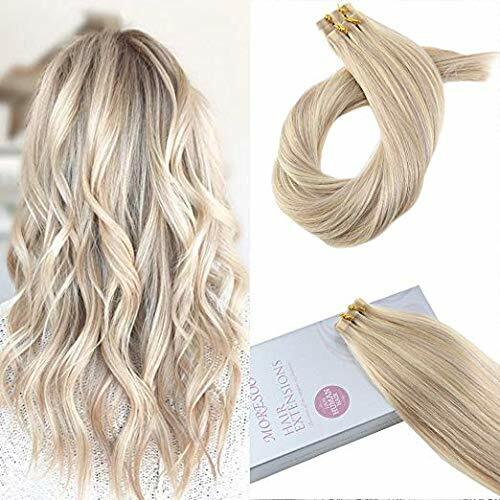 Moresoo hair is a registered brand in US,competitive price with pretty good quality.We not only provide service to every beautiful lady,but provide a reasonable price to salon owner.Please feel free to contact us,if you want a wholesale.If you need a color match,just email to us! Moresoo Tape in Hair Extensions Human Hair are all in stock now,you could choose fulfilled by Amazon to enjoy the privilege of Prime,free shipment via USPS need 7-10 business days to transport,expedited shipment via DHL or FedEx could guarantee you could get your pack within one week.If you purchase at least two packs one time,we could ship your pack via expedited shipment for free. Moresoo Tape in Hair Extensions is 100 human hair and man-made,with the advantage of high quality factory, Moresoo hair provide pretty good quality hair to every customer,you could send us a pic of you own hair to help you match your hair.2.5g per piece,50g per pack.We recommend 2-3 packs for a full head. Moresoo Tape in Remy Hair Extensions provides a great customer service to every customer,full refund to you when we receive the pack without any damage.Please feel free to contact us with the damaged pack,we will try our best to help you to solve it.Do not hesitate to contact us,if there is anything we could help you! Moresoo Seamless Tape Extensions has high quality,no tangle,no shedding,soft and smoothly,just treat them like your own hair,but because we have processed the color,so we don't suggest you to bleach or dye the hair,besides the hair are photoed by ourselves,it could be allowed there may be a little color difference.Please help us understand them.